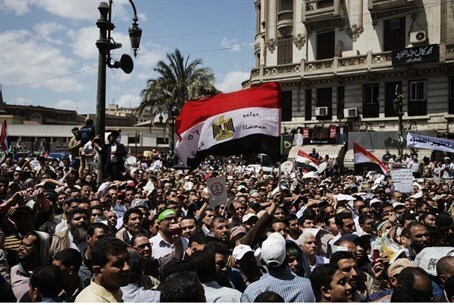 Four people were killed in clashes between supporters and opponents of ousted Egyptian president Mohammed Morsi. Four people were killed in clashes between supporters and opponents of ousted Egyptian president Mohammed Morsi on Monday, one in Cairo and three to its north, security and medical sources said. Two people died in clashes in Qalyub, north of Cairo, and a third was killed when he fell under the wheels of a train as he tried to flee, a security source told the AFP news agency. A fourth person died in hospital after being hit by gunfire during clashes near Cairo's central Tahrir Square, Mohammed Sultan, deputy head of the emergency services, told AFP. He added that at least another 26 people were injured in the violence, mostly by birdshot. Clashes between Morsi’s supporters and opponents have been ongoing since the Egyptian military ousted Morsi earlier this month, after days of protests calling for him to resign. The protests by Morsi loyalists have resulted in deadly clashes, with the unrest claiming more than 100 lives in all. Meanwhile, Egypt’s interim president Adly Mansour called for reconciliation among Egyptians as following the clashes in Cairo, reported Al Arabiya. President Mansour said he seeks to open a “new page in the nation’s history” following the June 30 uprising that ousted Morsi. Last week, Mansour vowed to protect the country from those who “want to drive Egypt to chaos,” in reference to continuous protests by Morsi’s supporters. The new Egyptian Cabinet was sworn in a week ago, as Morsi’s Muslim Brotherhood rejected its legitimacy. Meanwhile, members of Morsi’s family said on Monday they plan to file a lawsuit against the Egyptian Army, charging officials with kidnapping the former leader. Morsi has been held incommunicado by military officials since being removed from office on July 3. According to Egyptian military officials, Morsi is being held at an undisclosed location for his own safety, but even members of the International Committee of the Red Cross (ICRC) have been unable to gain access to visit him and assess his current condition, in violation of the Geneva Convention.